IT can take quite a wake up call to get on the path to a healthy lifestyle. For Lorraine Ereira, author of Love and Wheatgrass, that wake up call came when her husband, Simeon, was diagnosed with cancer. A sports therapist for fifteen years, Ereira, who moved to Benalmadena from England in 2014, found that research into traditional medicine and natural supportive approaches to treatments was her best coping strategy. Her book is the result of that hunt for information in hopes of helping other people who find themselves faced with the harsh reality of traditional medicine’s impact on the body. 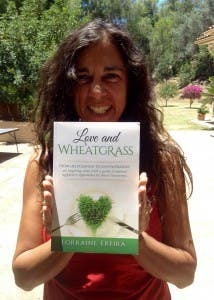 Love and Wheatgrass is divided into sections that detail Ereira and her husband’s journey with cancer as well as detoxifying diet plans to strengthen the body before treatment and post treatment tips for maintaining health. Wheatgrass played a large role in the therapy of Ereira and her husband as it helps treat anemia, a common side effect of cancer medicine that reduces the effect of the therapy. According to Ereira, she and her husband are healthier post-treatment since they are aware of the impact of lifestyle on the way their bodies function. The couple stick to a largely organic diet, eat less meat, avoid toxic exposure from household cleaning products, air fresheners, and body products, and make time for relaxation and meditation.